In retrospect, Shenmue was a colossal failure. It’s in the Guiness Book of Records as the most expensive video game ever developed ($40-60 million) but has only grossed a fraction of that from two games in the series and numerous versions, not to mention two soundtracks, books, and hundreds of pieces of memorabilia. It promised to create a new genre – FREE – and give the player unpredented freedom to explore and interact with a lifelike representation of small-town 1980s Japan. In reality, you were limited to interacting with what the developers allowed you to, and that often amounted to a lot of pointless objects that you could do nothing with except look at. The NPCs all looked unique and went about their individual daily routines, but using them in your investigation would give nothing more than a curt “I can’t stop right now”, often with a laughably bad English dub. The much-trumpeted time system would often mean that the flow of play was upset by the fact that you’d have to be home in time to not worry your doting housekeeper, Ine-san, or had to kill half a day of game time while waiting for a certain shop to open. It’s almost a paradigm of how to fail to execute some really wonderful ideas. For everything it does wrong, Shenmue would have been a bad game, but it somehow manages to command one of the most dedicated cult followings that you’re likely to find and is more often than not adored by those who finished it. Checking some of the Shenmue fan sites finds people actively hacking the game and talking excitedly about unseen areas and characters hidden away in the game code, and it still remains a popular subject for fan art, fan fiction, and even fan-made games. Shenmue III remains one of the most asked-for and yet elusive games around. Shenmue’s story sounds like any number of revenge thrillers and I doubt there are many who haven’t heard it. Ryo Hazuki, a 18 year-old Japanese boy with a martial artist father, comes home to find his home and family dojo under attack. He witnesses a Chinese crime lord, Lan Di, with inhuman levels of martial arts ability (think Pai Mei in Kill Bill) murder his father over a hidden artifact, the Dragon Mirror. Ryo vows to avenge his father and launches an investigation into the murder with only what he saw and his own, not inconsiderable, martial arts skills. From that point on, you control Ryo in his daily life as he interacts with his friends and the inhabitants of Yokosuka. One shred of evidence leads to another as Ryo pieces together the trail to Lan Di and the Dragon Mirror, and tries to work out why exactly his father had to die. The rest is history that anyone who played it is very familiar with and anyone who hasn’t played it should get familiar with. Like I said, it’s hardly groundbreaking stuff, but the story only serves to provide the impetus for you to go out and explore the town that the game presents for you. Regardless of how interactive or not it may be, it’s one of the more compelling examples of how to make a living, breathing world in a game. Shenmue II did the same thing on a bigger scale, but it’s the size of its rendition of Hong Kong that makes it lose some of the personality that made Shenmue so popular. 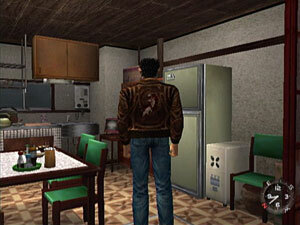 Few could forget the first time they explored Ryo’s house and garden, started talking to the neighbours in Yamanose or Sakuragaoka, or finally got to the bustling shopping street of Dobuita; fewer could recall the differences between the areas of Wan Chai in Shenmue II. In 1999 Shenmue was a graphical revolution. The usual platitudes – “interactive movie”, “virtual worlds”, etc – were all thrown in its direction and although now it can look slightly rough around the edges due to the allowances for the Dreamcast hardware, it still remains impressive. Even six years on, few have made a world as involving without populating it with real players. Bad English dub aside (bad enough to make many play the unintelligible Japanese version in preference – who can forget “I see” or “I’m looking for some sailors”? ), Shenmue also stands up as one of the most incredible aural experiences in gaming. The orchestral soundtrack is almost unmatched as the Eastern themes and haunting melodies blend with incidental muzak and hip-hop that you hear blaring from shops and passing teenagers. Only the likes of Final Fantasy come close. 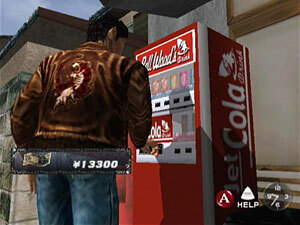 Shenmue is a unique beast that I could wax lyrical about for pages (indeed I used to when I ran the first Shenmue fan site) but ultimately, regardless of its flaws, it’s one of my favourite games ever. Those who have let themselves empathise with the characters and invest emotionally in the story, when they’re not complaining that they’ve yet to see the end, have found Shenmue to be one of the most beautiful games ever made. Not only is it still technically impressive, but artistically it’s almost without peer and deserved a much bigger reception than it got.